Editor’s note: Rhett Morris is the director of Endeavor Insight, the research arm of Endeavor, a nonprofit that supports high-impact entrepreneurs across the world. “I’ve probably revised this investor pitch deck 200 times,” a founder told me recently. She’d met with more than 50 potential investors before closing a seed round last month. This might sound excessive to some, but her experience is not unusual. Entrepreneurs often spend hundreds of hours raising funds from angel and venture capital investors. While these activities are clearly important, analysis of new data on startups suggests that founders should also dedicate significant time to something that many people overlook: recruiting great mentors. This simple strategy can increase a company’s odds of success more than almost anything else. Our team studied thousands of tech businesses last year. We looked specifically at companies in New York City’s tech sector, which was the fastest-growing tech sector from 2003-2013 and is now the second largest tech hub in the world. The goal of this research was to investigate how local tech firms had become so successful. Our analysts combined data from CrunchBase, AngelList and LinkedIn, and interviewed nearly 700 founders. (In total, New York tech founders dedicated more than a month of time to this project.) These sources enabled us to create the world’s largest database of a single entrepreneurship community. We found that a number of characteristics that are often highlighted as predictors of success for startups – such as starting a company while in college – don’t actually make much of a difference. While these conclusions on traditional startup myths were interesting, we uncovered several other intriguing findings by examining the habits of the best firms and founders. Internal scale: top 10 percent of peer group in terms of number of employees. Only 13 percent of the New York tech firms in the study met one or more of these standards. These top-performing firms include Gilt Groupe, Huffington Post, MongoDB, Shutterstock and Tumblr. Our analysis of the top-performing companies in New York’s tech sector revealed several interesting patterns. We found that many of the entrepreneurs leading these startups had strong personal connections to the founders of other successful companies. One of the most powerful connections identified in our analysis was mentoring relationships. Top-performing founders such as Chad Dickerson of Etsy and Nat Turner of Flatiron Health have been mentored by other successful entrepreneurs like Caterina Fake from Flickr and Brian O’Kelley of AppNexus . Relationships like these are quite powerful. 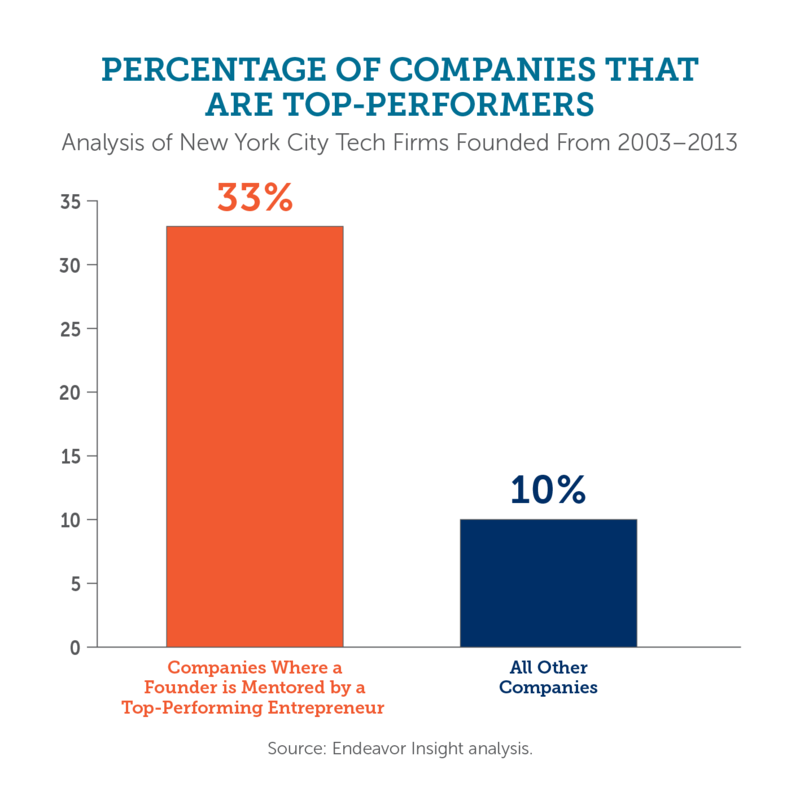 As the chart below illustrates, 33 percent of founders who are mentored by successful entrepreneurs went on to become top performers. This is over three times better than the performance of other New York-based tech companies. This pattern of mentorship can also be seen among entrepreneurs outside of New York. When Steve Jobs passed away, Mark Zuckerburg noted that the Apple founder had been an invaluable mentor. The founders of Dropbox, Drew Houston and Arash Ferdowsi, are mentored by Ali and Hadi Partovi, two successful serial entrepreneurs in the Valley. The benefits of mentorship aren’t limited to entrepreneurship. Research in other fields also shows that good mentors tend to improve the performance of their protégés. However, the magnitude of difference between the performance of companies with successful mentors and companies that lack them suggests that the value of effective mentors for startups may be especially high. Endeavor has supported more than 1,000 entrepreneurs at fast-growing companies in over 20 countries. In addition to our work connecting these founders to investors and training programs, we’ve cultivated thousands of mentoring relationships between our founders and experienced entrepreneurs and executives. These mentors have helped companies in the Endeavor network reach average growth rates of over 60 percent per year. A number of these firms have gone public or sold for figures well above $100 million. Here are three lessons that founders can use to build effective relationships with mentors. Lesson 1: Mentor quality matters. Simply having mentors isn’t enough. If you want your company to be among the best, you need a mentor who knows how to reach that level. Our analysis shows that mentors who had already achieved success in the tech industry were able to help younger tech startups outperform their peers by a factor of three. The benefits from lower-quality mentors were far, far lower. Lesson 2: Good mentorship requires a sustained relationship. The top-performing mentors and protégés in our New York study met together three or more times. In our work directly supporting entrepreneurs, we have also seen that consistent contact is critical. In fact, all new founders who join Endeavor’s network receive advisory boards made up of multiple mentors who meet with the entrepreneur at least once each quarter. Lesson 3: Great mentors focus on critical business issues. It’s important to utilize your mentors’ talents to the fullest. The relationships we identified between top-performing founders all focused on discussions of major issues that faced the protégés’ companies. The best mentors are very busy individuals. Founders should use the time and expertise of these mentors in the areas where it will do the most good. For more detailed information, click here. Special thanks are also extended to Mike Goodwin, who led our research on New York’s tech sector, and the members of the Global Entrepreneurship Research Network, who provided input on this project.